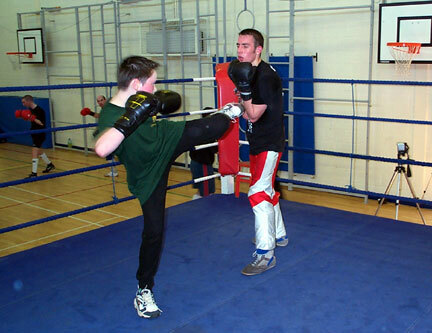 You can train in kickboxing for fitness, for fun or as a competitive sport. 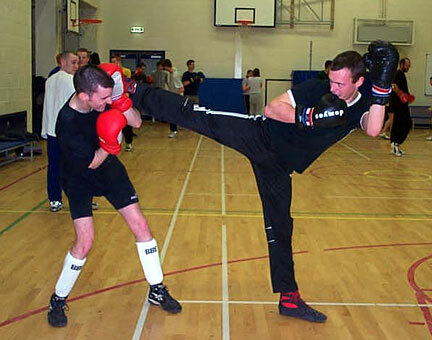 Savate kickboxing originated in France around 1830. This stylish art combines effective hand strikes and dynamic kicks. 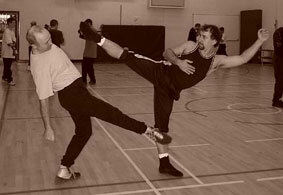 Look here for more about the History of Savate. We have beginners courses and entry level classes that are safe and enjoyable, and will teach you the skills you need to progress into one of our more challenging advanced classes. We also have a junior class for children aged 8 to 13 years. Savate was a demonstration sport in the Paris Olympic Games in 1924. There are many opportunities to compete, for those who would like to. The Great Britain Savate Federation has an annual league, see our members page for Academy national champions! 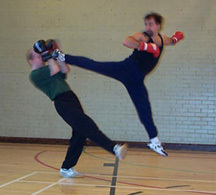 Savate Assaut: The majority of participants train and compete in assaut, where the emphasis is on style and technique, and only "touch" contact is allowed. All touches must be controlled and without force, and protection is worn to ensure safety. Savate Combat: A form of competition for the most experienced fighters. 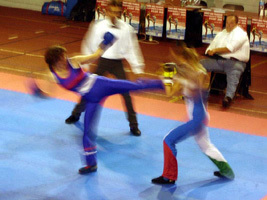 Combat fighters, male and female, are highly trained athletes, who are scored on technique, precision, efficiency and fighting spirit. 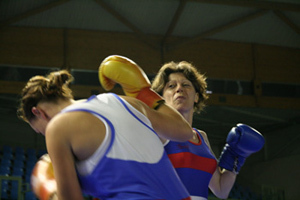 Several members of the Academy have represented Great Britain in World and European Championships. Signe Gundersen (70-76kg) was awarded a bronze medal in the 2006 World Assaut Championships. Other Academy competitors in the "Worlds" were: Agnès Aubert (under 48kg), instructor Julie Gabriel (52-56kg), Morgan Alexander (65-70kg), Simon Whitmore (82-89kg) and Mikael Andersson (over 89kg). 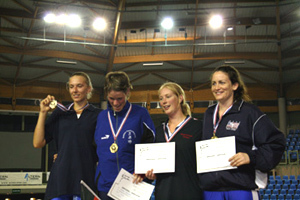 For the 2007 European Championships, Julie and Morgan were again selected to represent Great Britain. In December 2007, Julie qualified as an international judge for both assaut and combat. For more information on savate classes or personal training in Cambridge, please contact us. Old style savate looked a little different, using the out-stretched arm for balance, and to achieve a slightly longer range. Now, we prefer to protect our heads!